Hi there! I’m back today as promised with the birthday card I made for my Dad from my kids for his birthday last week. This is a digi image from Sassy Cheryl’s Stamps called Laugh it up. Every time I see this image it makes me smile 🙂 I’m sure it made my Dad smile too! 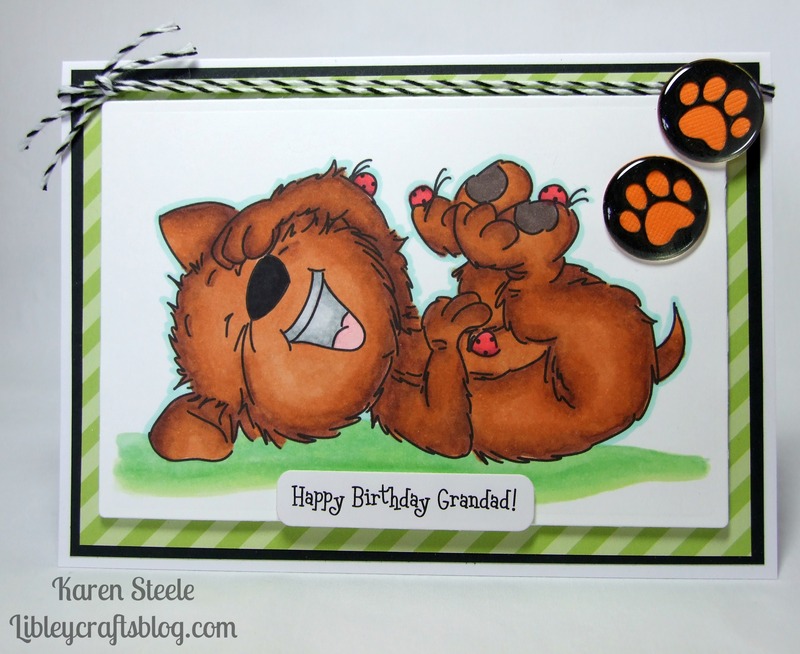 I also used Paper Smooches Paw-Print Die, black and orange card stock, twine, epoxy stickers, striped card stock from Lawn Fawn – Polka in the Meadow, and Spectrum Noirs. This is adorable – I started smiling before I even read your post! Great card Karen! Awww…super fun and cute! I’m sure your Dad appreciated this awesome card! What a great fun image and great card. I’m guessing a lot of laughter goes on when they get together! This card brought a smile to my face. I love, love this smiling cat. And the paw print detailing. Utterly adorable! This Card made me smile. FUN Image ! Oh how cute is this card!!!! Definitely brings a big grin to my face! Adorable!! !